The Winds of Kedem has been translated into Spanish by Daniel Yagolkowski, who translated Michael Crichton’s Jurassic Park. He is currently translating Cry of the Needle. 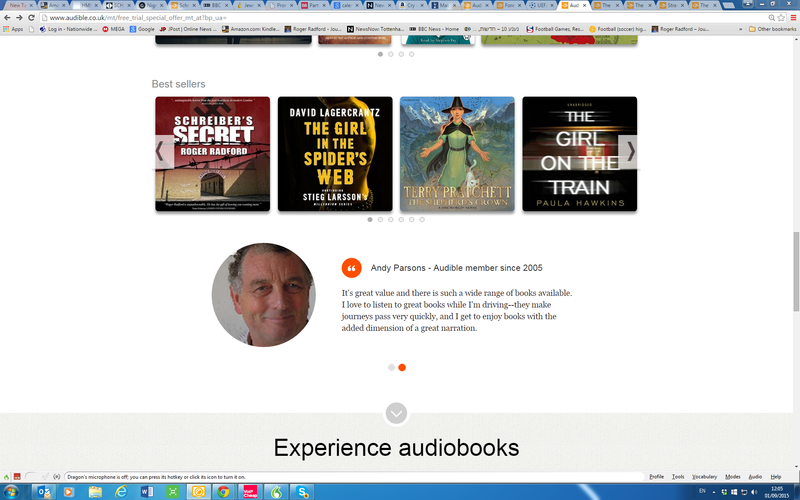 The audio book of Schreiber’s Secret has also won an AudioFile Magazine Earphones award . Watch and listen to the trailer at j.mp/SS-trailer ) AVAILABLE AT AUDIBLE (U.S.) http://j.mp/ss-audio AND (UK) http://j.mp/ss-uk The Kindle ebook has been translated into Spanish and Portuguese! More to come! Welcome to the website and blog of Roger Radford, journalist and bestselling thriller writer. Learn about my first book, The Winds of Kedem, a prescient tale of an Arab nuclear plot to destroy Israel. This was followed by Schreiber’s Secret, which revolves around a question of the identity of a Nazi sadist, and for which the film rights were sold. Cry of the Needle is a polemical thriller about medical malpractice and its murderous consequences. High Heels & 18 Wheels: Confessions of a Lady Trucker is a work of non-fiction, telling the moving story of Bobbie Cecchini, partly in my words and mostly in hers. Check out my blog for pithy opinions on subjects ranging from the Mideast to invasive spinal procedures. If you wish to contact Roger Radford, see Contact. If you don’t have a Kindle, Amazon offers a free app for iPads and PCs, etc. Why not also enjoy my Mideast Punchlines blog? Click HERE and read my personal reaction to the news, mainly supplied by the excellent honestreporting.com. CLICK HERE TO VIEW TRAILER OF MY INTERNATIONAL BESTSELLER THE WINDS OF KEDEM.